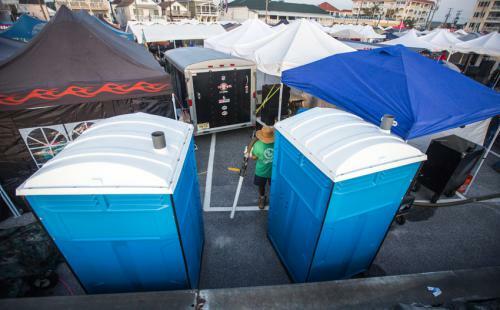 As a family-owned and operated company located in Belleplain, NJ, we have the means, resources, and equipment to set up mobile restrooms for events of any size. We have experience providing portable sanitation equipment for weddings, festivals, fairs, family reunions, RV parks, corporate events, construction jobs, and other types of events and functions. Not all gatherings require restroom trailers. Sometimes, a single rental will suffice. When this is case, we have single portable toilets available to rent. It’s one of the most convenient ways to add a toilet to any event. We keep all of our outdoor toilets clean and tidy, so that they’re ready for use upon arrival. Our company strives to meet the satisfaction of all of our customers, which is why we also have portable toilets that are handicap-accessible. Germs get passed around quickly when there is no clean sanitation available. Advances in technology have led to outdoor bathrooms becoming cleaner and more sanitary than ever. Each of our toilets comes with all of the essential amenities you would find in a typical bathroom. Outdoor restrooms are particularly important when the outdoor events involve food. Hand sanitizer still remains in second place to washing your hands with plenty of soap and water. Aside from the hygienic benefits of portable toilets, modern portable toilets are also able to better control strong odors. The last thing any party needs is an unpleasant aroma in the air. As a family-owned and operated company, you can rely on us to approach each event of yours with respect, efficiency, and professionalism. We understand how important proper sanitation is to the success of your project or function, no matter if it’s for residential or commercial purposes. The satisfaction of our customers is our highest priority. We take the time to find out what your exact needs are, so that we can provide the right type of service. With our high-quality products and affordable prices, you can trust us to take care of all your sanitation needs within your budget.